The Arroyo Grande and Morro Bay city councils both voted in favor of Styrofoam bans on Tuesday. Morro Bay council members voted unanimously for the ban. The Arroyo Grande council voted 4-1, with Councilwoman Barbara Harmon dissenting. The bans will prohibit the use and sale of Styrofoam products, with some exceptions. 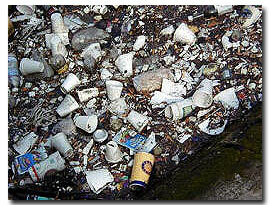 Styrofoam cups, food containers and disposable coolers will be banned. Styrofoam will still be permitted in Arroyo Grande and Morro Bay if it is used for packaged goods produced outside the cities. Also, Styrofoam trays used for raw meat, fish or other raw foods at stores will still be allowed. Arroyo Grande and Morro Bay are set to become the third and fourth cities in the county to adopt bans on Styrofoam. San Luis Obispo and Pismo Beach have already done so. Morro Bay officials are expected to start enforcing the Styrofoam ban on May 1. The Arroyo Grande ban will take effect six months after the council formally adopts the ordinance. Both councils must pass the ordinances on second readings in order to formally adopt the bans. The ordinances are expected to return to both councils on Feb. 9. So basically the only businesses that will be answering to this new ban are restaurants. Why will the grocery stores still be allowed to use styro for raw meat and fish? They could switch to plastic which is easy to recycle. And how is this going to be policed? I am all for styro being eliminated from the planet, but this ordinance, as it is stated, will have little impact. No more plastic shopping bags or Styrofoam will be blowing around Morro Bay….cool; Now what do we do about all of the dark green plastic doggy poop bags I see everywhere? some full some not. Im so glad they are protecting me and all the children from that dangerous Styrofoam! Bunch of slugs sit around and come up with this when the streets are worse than Tiajauna back alleys yet residents pay outrageous water and trash collection bills. the fact is that most businesses in both these communities stopped buying and using Styrofoam some time ago. too bad the morro bay officials can’t focus on the real topics such as where is the waste water treatment plant and why are they spending down the reserves faster than one can say “Styrofoam”. geez! Barbara Harmon voted against the Styrofoam ban. They do swim upstream maybe that will spawn a few thoughts. Has anyone yet to figure out Harmon? Reminds me of a salmon swimming upstream. She is all EGO all the time. she does what she thinks makes her look good. She comes to meetings with everything written down, even her comments, how is that for open minded. She buddies up with Kristen Barniech because she thinks Kristen knows policy and procedures. The only person not elected and the 2nd newest on the council, Kristen only knows what her daddy or the gym rats tell her she knows. Barbara thinks she is hot s*^t, she used to go and greet everyone who came to the council meetings of course just to introduce herself to them. Email her and her sign off includes Mayor Pro tem at the end, like it is some great title to have. She is a disappointment is what she is. She thinks siding with Barniech and Guthrie makes her look good. wonder what she will do when they don’t get re elected.